The last couple of blogs where about how to store GPS information on an Android phone. Now it is time to pull the information out again and display it on top of a Google Map layer. First let's start displaying a map on the phone. Earlier versions of the Android documentation had a dedicated tutorial on displaying maps, but the tutorial link that is still in the documentation is broken. Things have changed a bit since the early versions, so I guess Google will put out a new tutorial in due course. But it means that one has to work from the documentation alone. 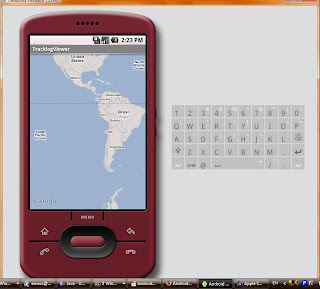 Anyway, displaying a map is displaying a MapView, which can only be done inside a MapActivity. The reason is that the MapActivity handles all the back-ground threads needed to do (p)re-loading of Map tiles at runtime, significantly more work that a normal Activity has to do. Here we have already done more than the minimum, as in addition to the map view we have already defined a view element that will hold the zoom elements of the map. We store this as a resource with the name mapview.xml in the layout folder. This displays us the basic map, but has nothing to do with our tracks so far. The next steps are first to center the map on our tracklog. A very simple (expensive and possibly buggy) way is to get all the trackpoints and just center the map on the first of them. We get the tracklog data via a ContentProvider, which in its unfinished rudimentary form was covered earlier and will be covered in more detail later. Here we get the first point, convert it with a utility function into a GeoPoint and center the map on it, also setting the zoom level. Now we get a map centered on top of the beginning of the track, but no tracklog. That will come in the next installment. For a real application, you will also have to consider that there are additional licensing restrictions on the use of Google Maps and its API, as well as the obligation to put a copyright notice into your application. The details for this are on the Android Terms and Conditions Page. Everything seems to be being identified apart from the "MapUtils" line, it does not recognise that anywhere. As I cannot compile the application without the MapUtils fixed I cannot post the LogCat. My initial thoughts were that the GPS coordinates were not writing to the database, however I have opened up the .db file and the coordinates are being inserted.